Filled with creamy avocado, sweet bits of clementines and meaty pistachio kernels, this quick and easy Brussels Sprouts Salad recipe is dressed with a light and tangy Grapefruit Vinaigrette. This recipe was created for my client Pompeian but all opinions are my own. But why can’t salads — the right salads — almost be perfect for winter? They can be, for sure, especially if you’re talking about a fabulous citrus-y salad with raw Brussels sprouts, creamy avocados and meaty pistachios. That’s a salad perfect for winter — because those are the flavors that are in season right now. 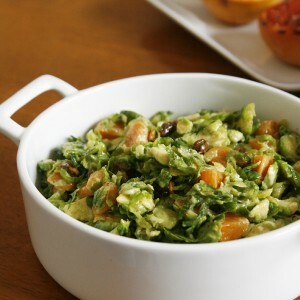 With a subtle mix of flavors and textures, this salad uses shredded Brussels sprouts raw. They add a nice crunch to the bright flavors and textures. Brussels sprouts are my favorite vegetable, but it wasn’t until the last year (thanks to a crazy popular salad mix sold at Costco) that I realized they are fabulous served raw. For the dressing for this Brussels sprouts salad, I used fresh grapefruit juice, garlic, salt and pepper with Pompeian Extra Virgin Olive Oil. I love the flavor of this olive oil, and it pairs so well with the bright flavor of grapefruit (I used ruby red, but you could use a more tart variety, if you prefer) and zesty garlic. You might remember that I have been working with Pompeian this year developing recipes, but I can tell you that even if I wasn’t I would be buying this oil for dressings because it has such a nice olive-y flavor. And something cool this holiday season? You can go to Facebook.com/Pompeian or Pompeian.com to create your own personalized bottle of Pompeian Extra Virgin Olive Oil — all you have to go is use the tool there to generate and print a customized label to place on a 24 oz. bottle of Pompeian extra virgin olive oil. How fun, right? 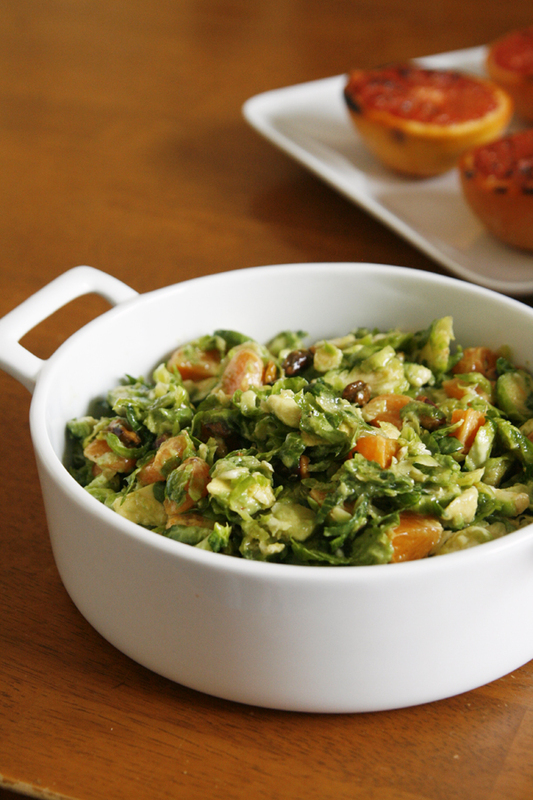 Making this Brussels sprouts salad is so quick and simple. Here’s what you do: Mix the ingredients. Whisk together the dressing. Pour over the veggie mix. Toss well. Chill. That’s it. In just a few minutes, it’s all made and just waiting for you to dig in. And, of course, you could dig in right away. But this is a salad that gets better when it has a few minutes to chill a bit. The flavors meld together into a pleasant, craveworthy thing. And if you want, serve it with something warm like grilled chicken or steak or sauteed shrimp. That makes it all the better. Are you a Brussels sprouts fan? 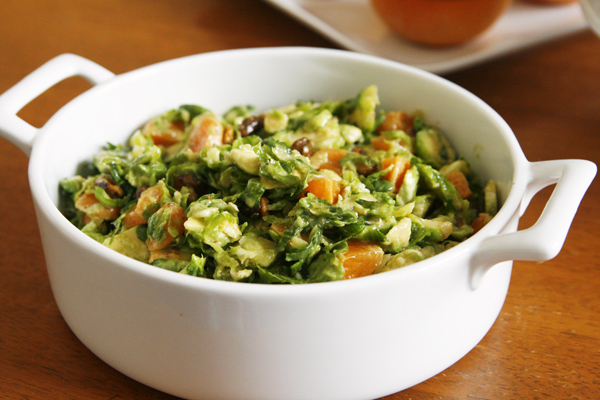 In a large mixing bowl, stir together the Brussels sprouts, avocado, clementines and pistachio kernels. In a small bowl, whisk together the grapefruit juice, olive oil, garlic, salt and pepper until it is fully combined. 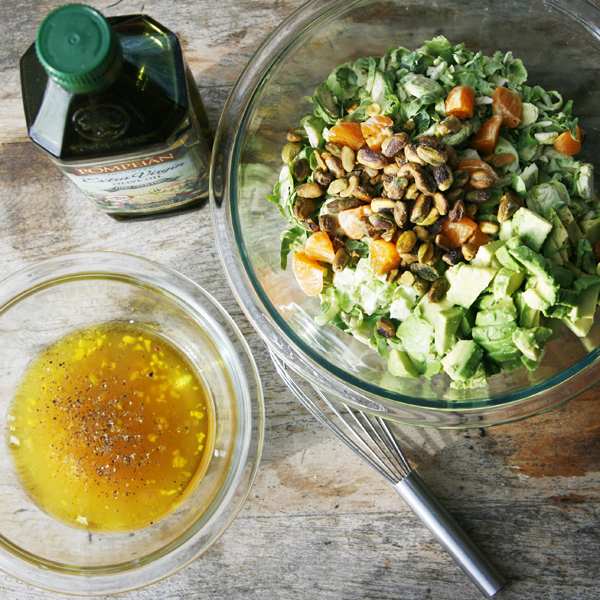 The dressing should look cloudy -- which means it's emulsified and ready to use. Pour the dressing over the Brussels sprouts mixture and toss to combine. Taste, and season with additional salt and pepper, as needed. Disclosure: I was compensated for creating this post but all opinions are my own. The addition of avocado is inspired. I want to eat this right now! Between the avocado and the grapefruit vinaigrette, I’m already smitten with this salad. Oh how I wish this was my lunch! Pinning! I was just looking for a brussels sprouts salad earlier today! So many of my favorite foods are in this salad – and I especially love the grapefruit vinaigrette. I’ll still have the salad even though it’s cold out. You have some great flavors going on here and love the brussels sprouts! The fresh grapefruit juice and extra virgin olive oil dressing sounds so fresh and delicious! Love that you added pistachios, yummy! I am NOT a Brussels sprouts person, but my fiance is — I bet he would love this salad! This is the perfect winter salad! Love the addition of grapefruit. That grapefruit vinaigrette looks so bight and flavorful! I don’t think I would’ve thought to combine avocado and brussels sprouts – but now I won’t be able to stop thinking about it. I love everything in this salad, and the suggestion of topping with a little grilled chicken or shrimp has my belly rumbling! This is such an interesting combination of ingredients! Looks great. 🙂 Saving this recipe for my veggie-loving husband! We love brussel sprouts in our house but have yet to try them raw instead of oven roasted. Your salad sounds like the perfect way to try them – really sounds and looks amazing. Thank you! I am loving everything about this salad! And the vinaigrette! This is so gorgeous, I can’t stop staring at it. We just discovered Brussels sprouts in our house. And I’ve been searching for ways to make them. this is definitely happening next week (OH! Or maybe tonight! along side my meatloaf!). I love me some brussel sprouts! The textures will keep me eating till I reach the bottom of my bowl and the person next to me. Mmm. OMG this looks so good. I had to pin for later as I want to try this . Wow-oh-wow! This is so super simple and easy! And pretty! Thanks for sharing. I made this for dinner tonight. I didn’t have Clementine’s but I did have a pear. It was light and refreshing, delish!